The white general of the War of Independence was one of the most significant personages in independent Finland, a prominent figure in public occasions, honorary member of several communities, promoter of general welfare and the unity of the nation. On the other hand, the reds found it difficult to digest him, and it was not until the 1930s that signs of forgetting the past began to be seen in that quarter. The spirit of the Winter War proved the unity of the nation. "Marski", the Commander-in-Chief of the Winter War, rose to be one of the symbols of this unity. 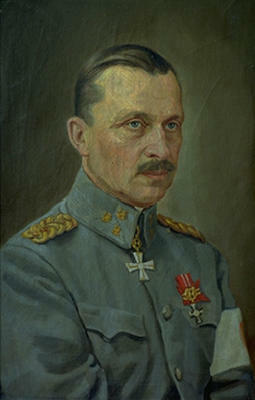 The decoration introduced in the Knighthood of the Cross of Liberty, and awarded for merits and bravery in operations of war, was named Mannerheim Cross. Photographs of Mannerheim and objects from the course of his life were eagerly sought, and his Order of the Day dedicated to Finnish mothers was displayed on the wall of every church in the country. Gradually, the leftist working-class movement too, began to accept and appreciate Mannerheim, if not without reserve. Mannerheim had succeeded in keeping outside of party disputes, which was one of the factors that facilitated his appreciation as a national symbol and hero. A certain stiffness, characteristic of his behaviour, created a respectful distance around his person. He was an object of worship during the wars and long after his death, and criticism against him has been vehemently rejected. As a token of gratitude and respect, Mannerheim was awarded the title of Marshal of Finland on his 75th anniversary on 4 June, 1942. The birthday celebration aroused attention abroad, when the leader of Germany, Adolf Hitler, paid homage to him and appeared among his numerous congratulants. 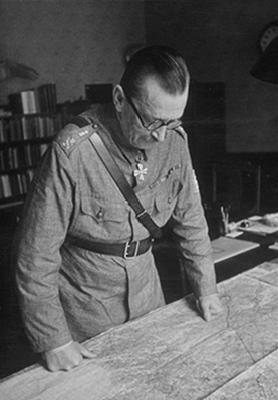 From the Soviet point of view, Mannerheim symbolized the anti-Soviet attitudes of the Finns. Nevertheless, even Stalin admitted that Finland and the Finns, under the leadership of Mannerheim, had emerged from the war with credit.